Atal Bihari Vajpayee 25 December 1924 Indian Krishna Bihari Vajpayee Krishna Devi Poet, Journalist, Political Activist The first Prime Minister from outside the Indian National Congress party to serve a full five-year term. 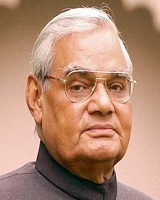 Vajpayee was elected to the Lok Sabha nine times and twice to the Rajya Sabha. He also served as the Member of Parliament for Lucknow, Uttar Pradesh. A list of popular Hindi Atal Bihari Vajpayee quotes are given below.